While strength training is obviously a staple of any serious basketball player's year-round improvement program today, it wasn't always the case. There was a time not all that long ago when working out in the weight room was taboo for hoopsters. The prevailing "wisdom" was that strength training would build unnecessary body weight and tighten muscles, thus slowing the player down and hindering shooting touch and ball handling ability. Additionally, and certainly unthinkable today, many so-called experts of yesteryear believed that lifting weights regularly would increase an athlete's susceptibility to injury (even a novice, contemporary follower of sports knows that strengthening the body helps to prevent injury not cause it). However, their was one aspect of basketball strength training that lagged the pack. Strength workouts were more often than not only prescribed for the off-season months. In season strength work was discouraged for the most part. The feeling was that adding additional physical activity in the form of strength training to already demanding practice sessions and games would be too much for players to handle. Finally, and not a moment too soon if you ask me, strength work became a year-round affair for all basketball players, with cagers lifting consistently not only in the off-season but throughout the competitive campaign as well. This change of heart toward in season lifting has allowed basketball players to maintain their hard earned strength gains on a season long basis. It has been estimated that elite athletes incur noticeable strength loss in as little as three weeks after the discontinuation of strength training. For basketball players in the midst of a season this may happen faster and deeper because of all the up and down running, jumping, and cutting required when playing the game. As such, in season strength training has become at least as important as the off season variety and is now a prerequisite for basketball athletes at all levels of play from middle school on up though the professional ranks. Listed and explained below are numerous ideas and strategies that coaches and their staffs can incorporate in order to make in season basketball strength programs as efficient and successful as possible. Good luck! Every experienced basketball coach and strength and conditioning specialist is well aware of how difficult it is to plan and implement an in season strength training program. Numerous variables must be taken into account, including, but not limited to, player fatigue, travel snags, injuries, facility availability, media/alumni responsibilities and unexpected schedule changes. As such, it is essential that coaches and strength and conditioning personal meet prior to each season and, after carefully studying the game and travel schedules for the upcoming campaign, devise a season long team strength training itinerary for their players. Chances are, of course, this schedule will have to be updated and fine tuned from week to week, but beginning with a blueprint will serve your team well. Coaches may also want to caucus weekly with their strength and conditioning staff and team trainers as the season progresses in order to maintain strength program continuity. Multi-joint exercises (movements that incorporate more than one joint and train multiple muscle groups at once) will be the focal point of your team's year-round strength training program. Because of their efficiency, multi-joint movements such as bench presses, squats, dead lifts, and chin-ups should be used exclusively during in-season strength sessions. While there is a place, albeit relatively small, for single-joint exercises (arm curls, leg extensions, etc.) in your overall strength routine, their use should be limited to the off-season when more time and energy are available for the weight room. For in season basketball strength workouts I try to always choose exercises that stimulate the largest number of muscle groups possible. This more bang for your buck (or more bang for your exercise) theory has proved very successful in maintaining in season strength for the basketball athletes I train. I feel strongly that this approach will do the same for your players. Before closing this section, I want to touch on a group of multi-joint exercises usually referred to as explosive, Olympic style lifts. These movements, which have become extremely popular in the sports conditioning world in recent years, include power cleans, snatches, high pulls, among others. If they are part of your team's strength training program, you must decide whether or not to incorporate them during the competitive campaign. Olympic style lifts, while very effective for building explosive power and overall body strength, are also very taxing on the nervous system. As such, some strength and conditioning specialists discourage their use during the physically demanding regular season. The sentiment being that their use would fatigue athletes unnecessarily, causing on court performance deterioration and raising injury risk. 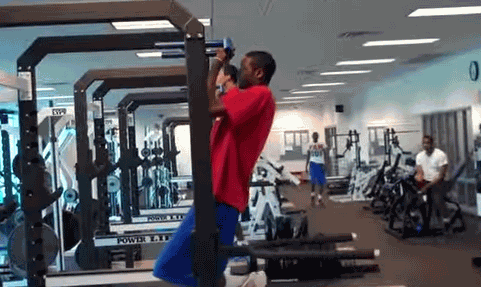 Strength maintenance is the one and only goal of a basketball in season strength program. Because of the tremendous physical, mental, and time demands of a basketball season, it is virtually impossible for players, especially those who log large amounts of minutes on the floor, to increase strength. In fact, just maintaining strength is very difficult for the majority of players over the course of the regular season regardless of how hard and conscientiously they work in the weight room. Notwithstanding, strength maintenance is a worthy objective, one that coaches, strength and conditioning staff, and players should work together to achieve. While others, the majority, need a full 48 hours or more to recover fully from an intense strength workout. As such, coaches, and especially strength and conditioning personal, should careful observe and monitor how individual players respond to strength training. This is best accomplished in the off season when competitive games are not a factor. From there, the information gathered can be used to plan appropriate in season strength programs for each individual player. Because recovery is of paramount importance during the competitive campaign, this player by player research is a must if you hope to have a successful, performance promoting in season strength program. While player energy will be depleted during this time of year because of the demanding practice sessions, it will be much less so than when the regular game schedule begins (adding travel and game stress to the mix depletes energy considerably). As such, coaches and strength and conditioning staff should make sure that their athletes remain consistent in the weight room over these important preparatory weeks. Two to three reasonably hard strength training workouts per week during this time is suggested. The workouts themselves will as closely as possible resemble those undertaken in the off season-although the weight incorporated will likely be less due to the above mentioned energy draining practices. This approach will pay great dividends as players move on through the heart of the long, grueling basketball campaign. Post game workouts should be accomplished immediately following the game while the body is still reasonably warm. (Letting the body cool down too much will adversely effect workout quality and leave players susceptible to injury.) The sessions themselves will be relatively short in duration-no longer than 30 to 35 minutes. The weight incorporated should be on the light side (remember a game was just played)! It is important that players remain optimally hydrated before, during, and after the workout. Finally, if an injury of any kind was sustained during the game make sure to have it looked at by the appropriate personal prior to beginning the strength session. Though rare, you will sometimes find that your schedule calls for a fairly substantial (6 to 10 day) break from game play. This can occur over the Christmas/New Years holiday, during exams at the end of the fall semester, and/or between the conclusion of the regular season and the commencement of post season play. Whenever a break presents itself, it is a tremendous opportunity for players to hit the weights hard. Getting three to five solid strength training sessions in without the physical and mental stress of competition can do wonders for player's in season strength maintenance. So check your schedule at the beginning of the season, and if you notice a long break in game action, plan to have your players take full advantage of it in the weight room. In my college playing days at Duke University I was very fortunate to play for two coaches who were creative thinkers. Both Coach K and Bill Foster before him had an instinctive feel for when a team as a whole needed a change of pace. One way they would break the tedium is by holding a team strength workout in lieu of regular practice (they also from time to time substituted volleyball games and half court shooting contests for conventional practice sessions as well)! This approach gave the team a welcome mental break from the monotony of practice, while at the same time allowing players to maintain their strength programs (as mentioned, no easy task during the busy regular season). Coaches at all levels would be well served experimenting with this type of alternate to practice from time to time. Since the day will be dedicated exclusively to strength training without any basketball related activities, I recommend that players train as intensely as possible in order to get the most out of the lifting session. Perhaps the best way to ensure that players remain strong for the duration of the basketball season is to encourage them to develop as much strength as possible during the off season months. Ideally, players should be at their strongest on the first day of regular season practice. Year-round strength programs should be designed to achieve this objective.